Dr. Tara Zandvliet has written nearly one-third of all 486 medical exemptions from vaccinations for the entire San Diego Unified School District, according to vaccination records obtained by Voice of San Diego. Medical exemptions have been climbing since a 2015 state law limited parents’ ability to obtain personal belief exemptions. Dr. Tara Zandvliet doesn’t believe in a one-size-fits-all approach to medicine. It is a philosophy most of her colleagues would agree with, most of the time – just not when it comes to vaccinations. Zandvliet appears to have cornered San Diego’s market of vaccine-skeptical parents. She has written nearly one-third of all 486 medical exemptions from vaccinations for the entire San Diego Unified School District since June 2015, according to vaccination records obtained by Voice of San Diego following a public records request; far more than any other doctor. Amid ongoing measles outbreaks across the country, other doctors expressed concern science doesn’t back up her rationale for granting exemptions and worry she is unnecessarily putting school children, and the public, at risk. Using medical exemptions to bypass California’s mandatory vaccinations for school children is a practice on the rise, according to a study published in the journal Pediatrics. The number of medical exemptions has tripled since 2015, when California became the third state to stop allowing families with children in public school to opt out of vaccinations because of personal beliefs. Countywide, the percentage of kindergartners receiving a permanent medical vaccine exemption has increased six-fold since the 2015-2016 school year – from 0.2 percent to 1.2 percent, according to data from the California Department of Public Health. San Diego Unified “has noticed some physicians issuing exemptions that appear to be excessively frequent and based on criteria that is not aligned with guidelines from the Centers for Disease Control and Prevention,” district spokeswoman Maureen Magee wrote in an email. She said the district has raised its concerns with legislators, as well as the local chapter of the American Academy of Pediatrics. School districts have no role in approving or disapproving the exemptions. But Zandvliet said she’s honestly writing exemptions based on her best understanding of medicine. A handful of doctors across the state, the study found, are relying on the same reasoning as Zandvliet to issue a medical exemption from some or all vaccines: family history of allergies or autoimmune diseases. But most public health officials, as well as the American Academy of Pediatricians and the Center for Disease Control, do not endorse this as a reason not to immunize. It’s a “soft reason,” Dr. Mark Sawyer, an infectious disease specialist at Rady Children’s Hospital, told me. It’s possible genetics may increase a child’s risk of having an adverse reaction to a vaccination, Sawyer said. But so far, it is only a theory held by Zandvliet and a small handful of others. The theory is entirely untested, he said. Zandvliet is listed as a “vaxx-friendly” doctor on many of the websites dedicated to helping parents find someone who might not be so insistent on giving their children vaccinations. She admits that many anti-vaxxers – or those who might be vaxx-questioning – find their way to her practice. But she said she only issues an exemption for those who meet her qualifications. She denies seven out of 10 exemptions, she estimated. And her goal is always to persuade people to get all of their vaccinations, she said. But based on the numbers, Zandvliet could be threatening that 95 percent threshold. 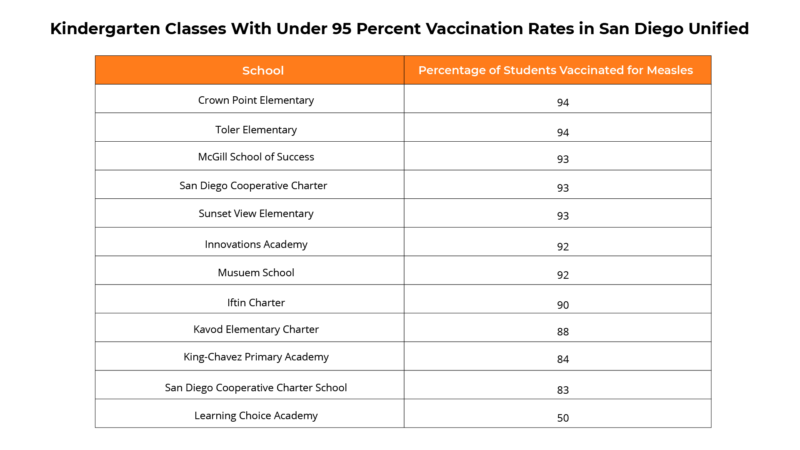 In San Diego Unified, 12 elementary schools have classes of kindergarteners with a lower than 95 percent vaccination rate for the measles vaccine. Another 14 schools have kindergarten classes below the threshold for the diphtheria and whooping cough vaccine, called DTaP, according to California Department of Public Health data analyzed by Voice of San Diego. By Zandvliet’s own estimation, these are two of the most important vaccines a child can receive in this part of the country. Many child care and pre-school centers have even lower vaccination rates. When measles outbreaks happen – as seen recently in Oregon, Washington and New York – the children most impacted are those whose parents have opted out of vaccination. But others get impacted too. Vaccines, for instance, do not work on a small portion of the population. Others have a widely recognized reason to have a medical exemption – such as someone receiving chemotherapy or who recently underwent an organ transplant. And yet others are too young to have gotten all their vaccinations. Measles kills roughly one in 1,000 children. Others have severe side effects such as deafness or brain damage. As Zandvliet notes, vaccines can have side effects too. She thinks other doctors should acknowledge this with patients more often and help persuade them that the benefits outweigh any risks. “When I’m more honest with them, it’s easier to convince them,” she said. Many doctors who are allowing medical exemptions because of family history are also charging steep fees for their visits, according to the October study. Zandvliet charges $180 for an appointment to receive an exemption. It is the same price she charges for a regular physical, she told me. Zandvliet is among a few doctors who do not accept insurance. Because patients pay out of pocket for an appointment, she can spend more time with them, she said. Zandvliet started operating her business this way several years before medical exemptions became a way for vaccine-skeptical people to bypass California’s vaccine mandate. Sen. Richard Pan, a Sacramento Democrat and medical doctor who wrote the 2015 law that stopped allowing parents of public school children to claim personal belief exemptions from vaccinations, said Zandvliet’s payment practices were troubling. “In a normal practice, we don’t charge money for a medical exemption. If a child has a real reason that is acknowledged by the CDC for a medical exemption, then we just write it,” he said. Pan is worried about the drastic rise in medical exemptions that has happened since his bill took effect. He’s introduced new legislation this session that could make it harder for parents to obtain a medical exemption, but has yet to provide details on how that would work. In Mississippi and West Virginia, the only two other states with bans on personal belief exemptions, public health officials, rather than doctors, are the only ones who can give out a medical exemption. Pan said since vaccinations are a public health concern, that is appropriate. But he did not say whether would pursue such a policy here in California. 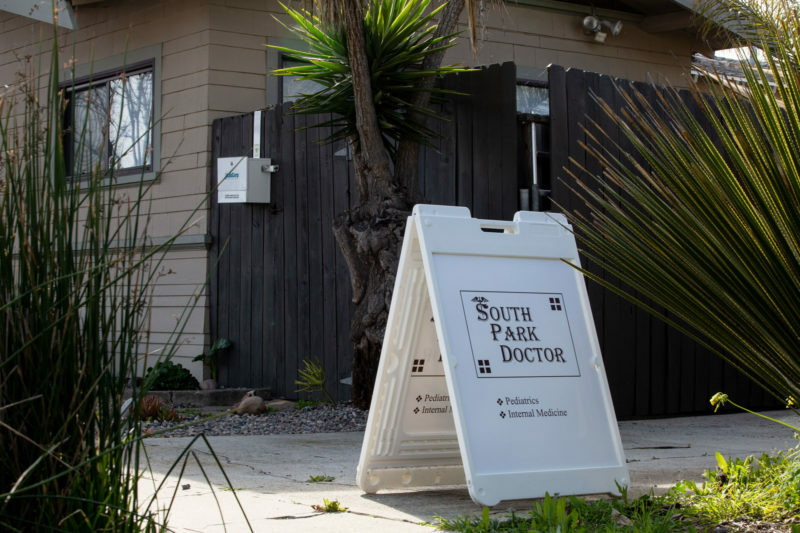 Pan also said there might be a way to strengthen the Medical Board of California’s authority to sanction doctors who give out inappropriate exemptions. So far, Dr. Bob Sears, who rose to prominence in the vaccine skeptical movement, is the only doctor in California to receive a sanction. (Sears, who practices medicine in Orange County, wrote 16 of the medical exemptions listed in San Diego Unified’s records.) It is difficult for the board to hand out sanctions, because they need access to families’ medical records. But the families who get exemptions are often in “collusion” with the doctor, so they don’t cooperate, Pan said. Zandvliet believes that one day soon, research will catch up to her. She acknowledged there is not much evidence to suggest having a family history of autoimmune disease significantly increases risks from vaccinations. But she said she’d like to design a study to show that it does, or see someone else complete a similar study. A page on Zandvliet’s website describes in detail the reasons she will grant a medical exemption. Just before this story published, she said she had removed three qualifying conditions from the site: eczema, psoriasis and asthma. “I have found that a few of the diseases on my list seem to invite misinterpretation more than others, and so I have deleted them,” she wrote in an email.